Posted By PA Breast Cancer Coalition on July 30th, 2009 at 6:53 pm | 1264 comments. Summer has finally arrived in Pennsylvania. What would a beautiful summer day be without a Home Run Derby? 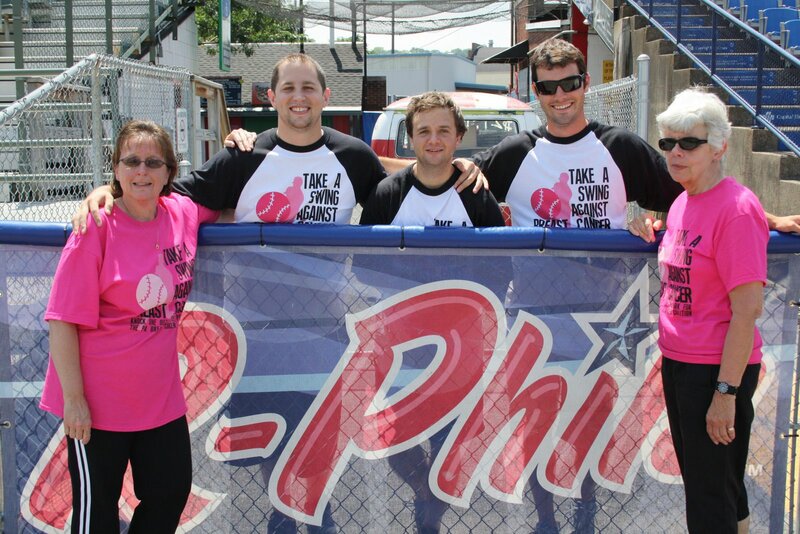 The PBCC crew and volunteers took First Energy Stadium by storm today and pumped everyone up for the Derby! PBCC Lehigh Valley Vice President Sandy Cray was on hand to be the voice for the day to lead our teams and volunteers toward the homers. 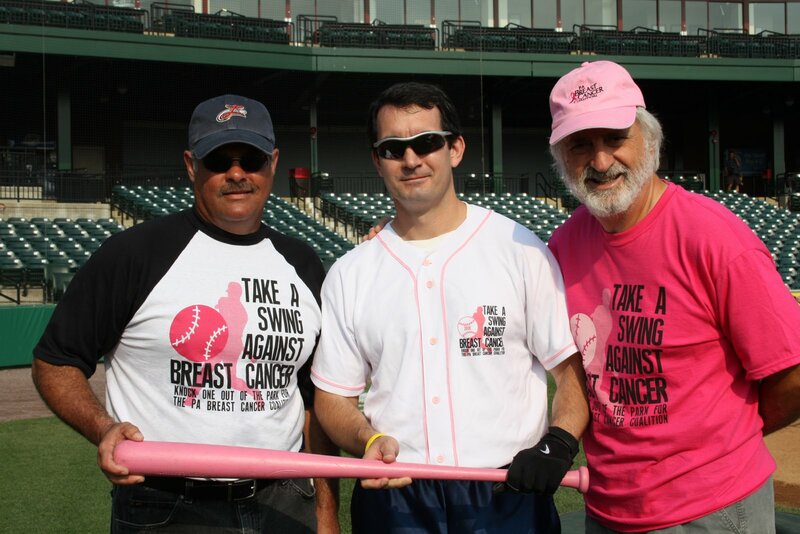 A total of eight teams came out today to take a swing against breast cancer. Quite a few batters hit home runs! I’ll get to that list later. But take a look at the team scores! On the Fleetwood Bank team, all four batters hit home runs! Dewey Oriente hit 6, Cody Kulp and Mike Bisenius hit 5, and Tyler Mertzer hit 2! 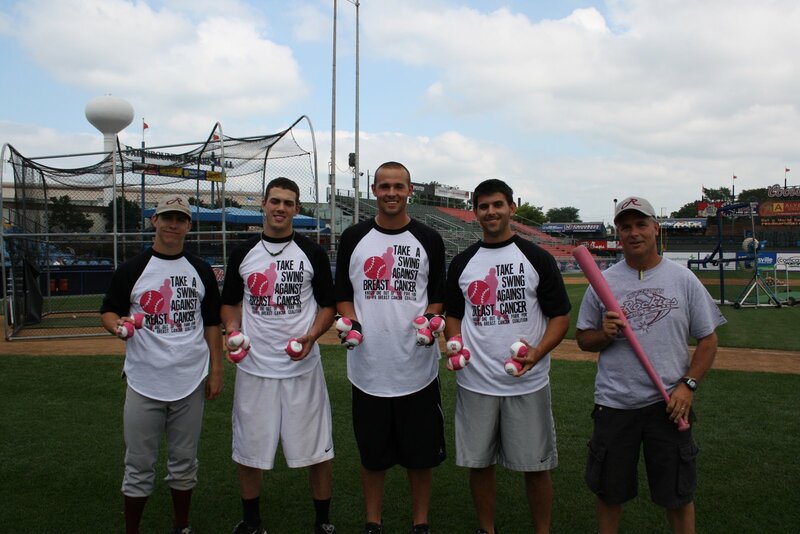 Check out the team with their pink and white home run baseballs! Carmelo Ocasio and Matt Sola from Reading Express Indoor Football Team 1 both hit one homer. And Ian Cooper from Reading Express Indoor Football Team 2 hit one out of the park too! Screwball from the Phillies hung out with the crowd for a bit. He even went out and fed baseballs into the pitching machine! Thank you to everyone who came out today in Reading! It was a blast! Check out all of the photos on Facebook! Posted By PA Breast Cancer Coalition on July 29th, 2009 at 8:29 pm | 104 comments. The Scranton/Wilkes-Barre Home Run Derby has been rescheduled for Friday, August 14th at PNC Field. If you were on a team, you should have received a phone call already! If you were volunteering, you will be called soon! There are still spots available to volunteer and have a team! 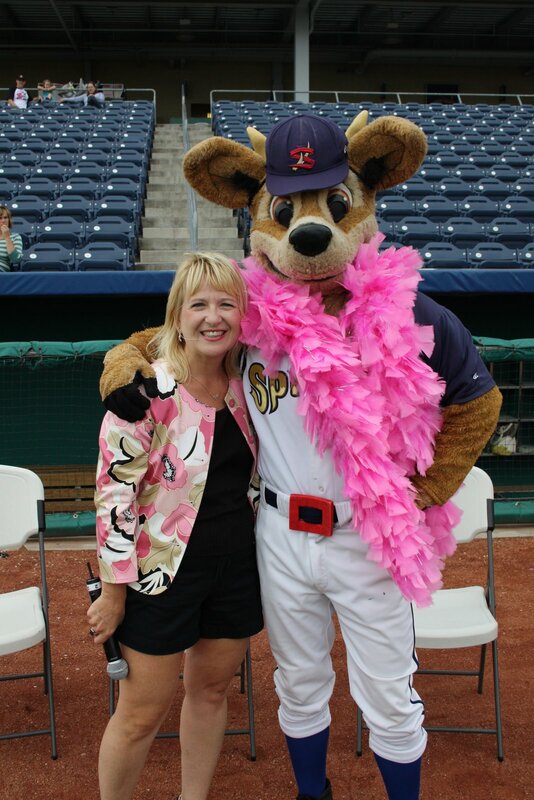 Grab a few friends and come out to the Scranton/Wilkes-Barre Yankees at PNC Field on Friday August 14th to support the PA Breast Cancer Coalition! Call 1-800-377-8828 today! Posted By PA Breast Cancer Coalition on July 27th, 2009 at 1:39 pm | 1390 comments. To round out the week of four Derby events in a row, the staff made it up to the State College Spikes. The forecast looked gloomy. Showers were predicted intermittently throughout the day. But Katie at the Spikes was optimistic and the crew continued to set up. The sky did not look promising. But the field was ready, the volunteers were ready, and our guest announcer Tammy Miller was pumped. The first team, Pam’s Pinch Hitters, stepped up to the plate and it started to drizzle. The small amount of rain did not dampen the spirits. After a few minutes, it passed. We continued on with the Derby while the clouds parted and the sun decided to wake up. A few batters were able to send the baseball out toward Mount Nittany with home runs. From the Lemont Ducks, Brendan Pifer had one home run and Steve Weavor had two. And from Graystone Bank Team 1, Eric Keptner hit a homer! Way to go fellas! A HUGE thanks to Tammy Miller for being our guest announcer!! She was absolutely amazing! The crowd loved her enthusiasm along with her jokes. She knows how to hit everyone’s funny bone! Another thanks goes out to WTAJ. They came out to the Spikes and interviewed several batters, Tammy, and our Director of Communications Sarah Lightman. Check out the story! Also log on to Facebook and check out all of the photos from last Thursday! Only one Derby this week, and it’s at the Reading Phillies! Posted By PA Breast Cancer Coalition on July 27th, 2009 at 12:18 pm | 99 comments. The Home Run Derby rolled into the Lehigh Valley on Wednesday, July 22nd. The beautiful stadium was a great setting for the home stretch of the Derby. Nine teams stepped up to the plate and there were also a few guest hitters throughout the day. Lehigh County Executive Don Cunningham stopped by and took a few swings. 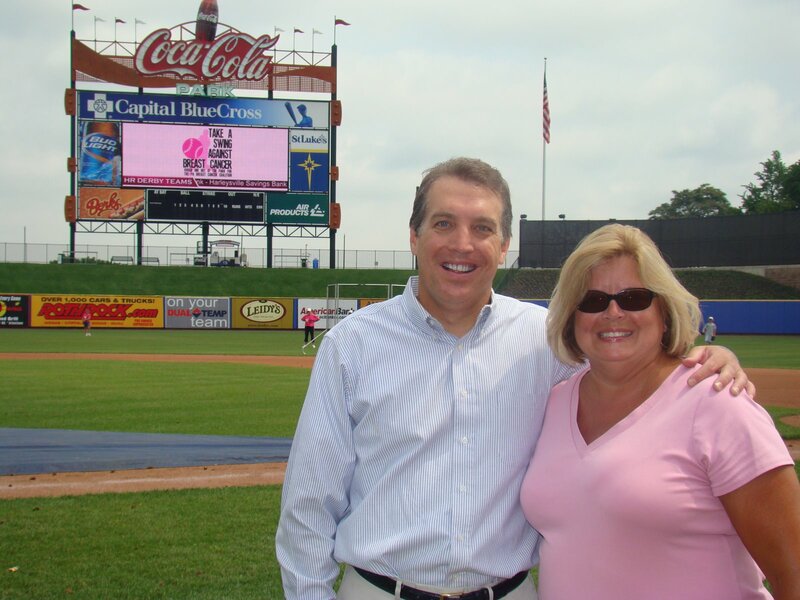 He is pictured here with PBCC Lehigh Valley Vice President Sandy Cray. 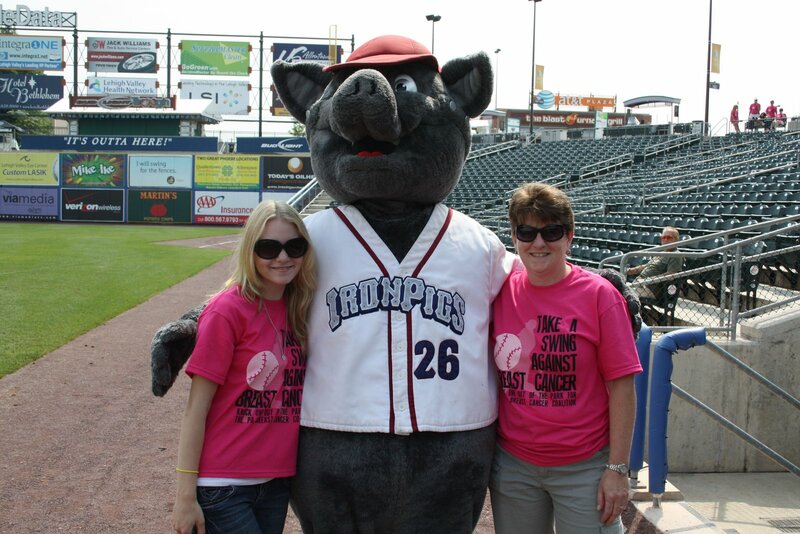 Ferrous from the IronPigs also made an appearance and hung out with the crowd! Beard Miller Company and Jim Thorpe National Bank Team 1 tied for first! This is the second tie in Derby history!! Our first was last year in Washginton. Jim Thorpe also had a couple batters who knocked the ball out of the park! Greg Pecha hit two home runs and Derrick Reis hit one! Way to go! I would also like to thank Ken Matthews for being our guest announcer! Ken was a great announcer and comic relief for all of the teams. Thanks for coming out Ken! Be sure to head over to Facebook for all of the photos from Coca-Cola Park! Posted By PA Breast Cancer Coalition on July 24th, 2009 at 5:32 pm | 1179 comments. On Tuesday, July 21st, the Derby rolled into Washington, PA with a vengeance. 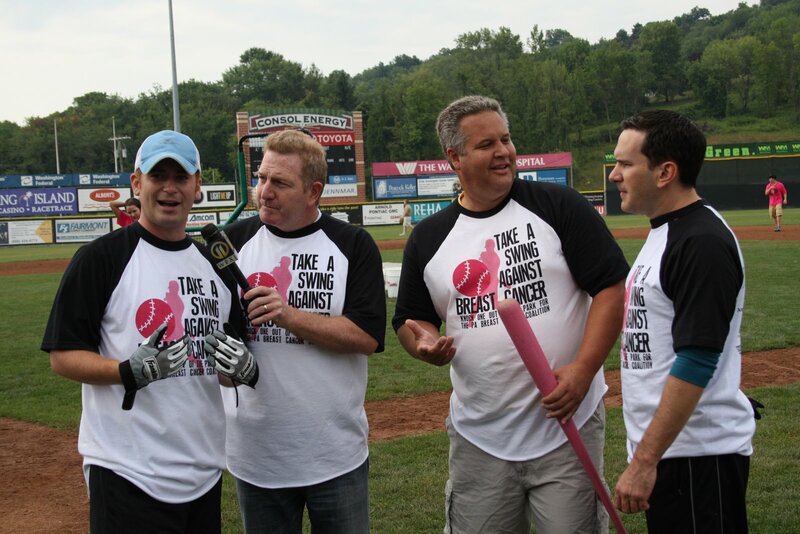 Seven teams took to the field at CONSOL Energy Park ready to hit one out of the park for breast cancer! WPXI Channel 11’s Rich Walsh, Alby Oxenreiter, Bill Phillips and Scott Harbaugh came out to the field and took some swings. In all, the team racked up a score of 1,090 points. Check out the story that aired on WPXI! All of the home runs of the day belonged to First Federal Savings Bank Team 1. Scott Cree, Troy Cree, Mitch Monas, & Scott Throckmorton each hit two home runs! Way to go fellas! It was a short but fun day out at CONSOL Energy Park. The beautiful weather and the enthusiasm of the batters and volunteers made it an enjoyable event! Check out all the photos on Facebook! Posted By PA Breast Cancer Coalition on July 24th, 2009 at 3:44 pm | 137 comments. The Home Run Derby made its first of four stops this week in Erie. Jerry Uht Park was ready for the Derby and the supporters that followed. Nine teams came out to the Seawolves and stepped up to the plate. We had a special announcer take Frank’s place. Marilee Warner from the Erie Times News stepped up and offered her time to the Derby. She jazzed up the crowd and brought out her colleagues from the Erie Times News and GoErie.com. Thank you Marilee for your help! A special thanks to all the teams who came out! TESCO Tools showed their strength by claiming first and second place. Lee Rohan & John Fette from TESCO Tools Team 2 both had two home runs! Chuck Rambaldo from Connoisseur Media also hit two baseballs out of the park! And Doug Robison from Erie Times News hit one home run! Good job fellas! In an honorable mention, I’d like to thank Hibshman’s Heroes who drove up to Erie from Lancaster & Lebanon Counties to support the Derby! Thank you very much! 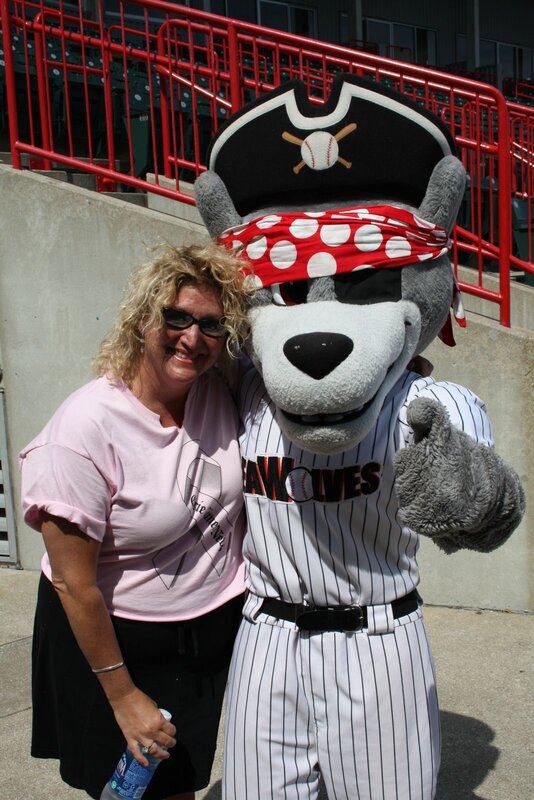 C. Wolf also made it out to the baseball diamond. He took a few swings and posed for a few pictures. He even loaded up the pitching machine for a few batters! In all, Erie was a success! After the Derby, the staff paid a visit to the waterfront to catch a view of Lake Erie! What a wonderful conclusion to an awesome day! Posted By PA Breast Cancer Coalition on July 24th, 2009 at 1:26 pm | 120 comments. The Home Run Derby rolled into Lancaster just a couple days after the kick off War of the Roses event. Teams had 48 hours to rest and re-hydrate. But both Rep. Boyd and Rep. DePasquale were ready for another showdown. Both brought the same team members, but this time, Rep. DePasquale’s team went first. 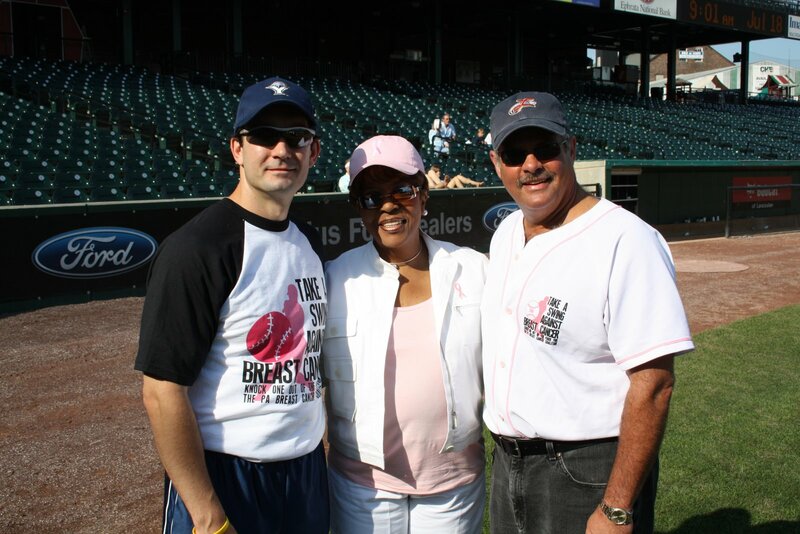 Rep. DePasquale and hit team started strong with many outfield and wall hits. Pete Gleason hit a home run and racked up a team high score of 410 points. But in the end, Team Rep. Boyd came out on top with 1,715 points, beating Team Rep. DePasquale’s score of 1,205 points. Rep. Mike Sturla also stopped by Clipper Magazine Stadium to take some swings. His total score was 310 points. Blue Ridge Cable 11 came by and interviewed a few participants about their involvement with the Home Run Derby. When the video gets posted, I will link it over. Rep. DePasquale brought his son Ben to Clipper Magazine Stadium for a few hits. Wearing his little league gear, Ben stepped up to the plate and hit a few baseballs! Way to go Ben! And Cylo from the Barnstormers made an appearance down on the field. 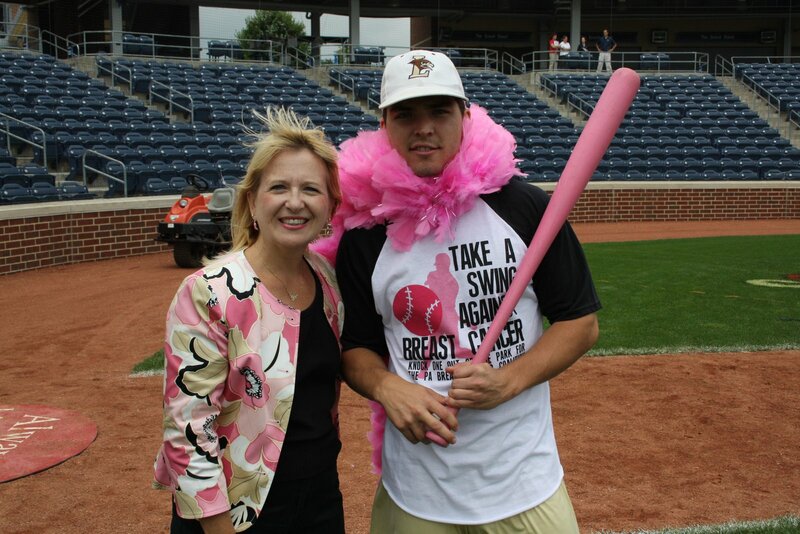 He also took a few swings against breast cancer. Check out all of the Lancaster Home Run Derby photos on Facebook! Posted By PA Breast Cancer Coalition on July 24th, 2009 at 1:15 pm | 107 comments. On Thursday, July 16th, the Pink Squad rolled into York for the conclusion of the War of the Roses and the Home Run Derby! Both Rep. Scott Boyd (Lancaster) and Rep. Eugene DePasquale (York) brought their teams to the Revolution for the second and final round of the War of the Roses. Both teams came out “swinging” but in the end, Team Boyd won the first round of the battle and the Derby in York. Rep. Boyd’s team consisted of Zach Shank, Marc Shoenfelt, Mark Stuckey, & Matt Turman. The team score was a high 2,225 points! 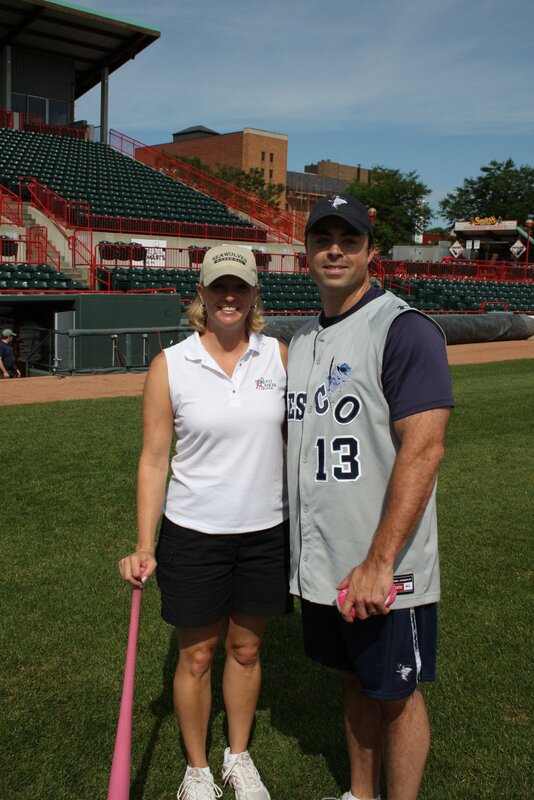 Team DePasquale had some strong hitters as well. Abe Amoros, Rep. DePasquale, Pete Gleason, & Chris Reilly scored 1,455 points. We had a few ringers on the field who were able to hit some home runs! Three members of Team Rep. Boyd hit homers; Matt Turman hit one, Marc Shoenfelt hit three, and Zach Shank hit SIX! Chris Carter from Beard Miller Company hit a home run as well! Way to go fellas! With eight teams, the day flew! But thanks to all who came out to the Revolution to support the Home Run Derby! 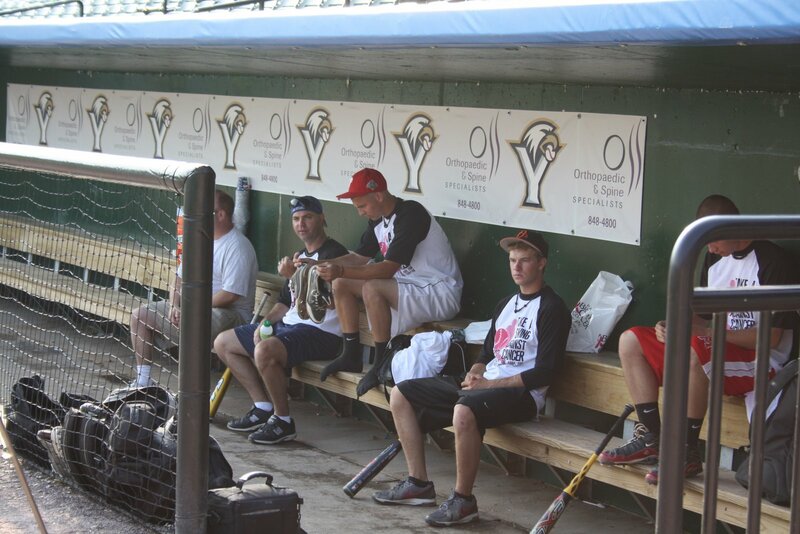 Check out the York Home Run Derby pictures on Facebook!